Recently, when I sorted through some boxes that had been sitting unopened for years, I discovered this old newspaper clipping of the front page of a local newspaper called the Tribune/Express (Hawkesbury ON), dated October 12, 1996. 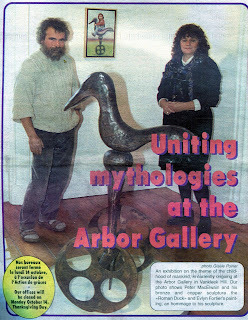 Peter and I had a show together at that time at the Arbor Gallery in Vankleek Hill, which we called "Uniting Mythologies", and a reporter interviewed us and took this picture. 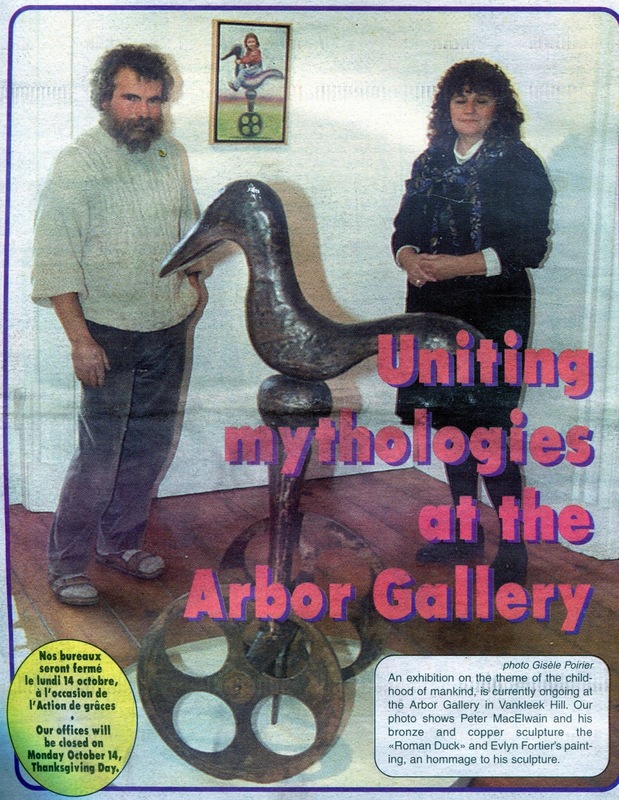 The sculpture is Peter's "Roman Duck" and the painting on the wall is mine (both later purchased so I haven't seen them for years either). Ah, the memories! June 3rd is Peter's birthday and I will be thinking of him and remembering wonderful times like this. Cheers, Peter! A lovely tribute and happy memories. I am so glad you posted this; it is nice to be able to put a face to the man who created those wonderful sculptures. p.s. When I was oh so much younger I also wore that curly hairstyle you are sporting in the photograph! I'll think of him too today. Thanks Evlyn.